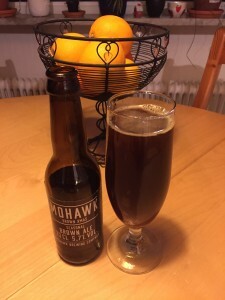 Mohawk’s Brown Xmas had no head to speak of and the colour of the beer is brown, as the name suggests. The aroma is nutty and slightly toasty and the flavour has a caramel sweetness, some nut character and some chocolate in it plus a hint of roastiness. The carbonation is low and the body is medium. Rating: 3.5 / 5 – A solid brown ale with a nice complex body to it without being too much. Seems a touch undercarbonated though, perhaps a bad bottle?